CASH & COMPANY - A true classic of Australian television, Cash & Company captures the essence of the 1850s a pioneering era where life was lived on the land and gold was ready for the taking.Wanted by the law, likeable bushrangers Sam Cash (Serge Lazareff) and cigar smoking accomplice Joe Brady (Gus Mercurio) are men with purpose and the know-how to stay one sneaky step ahead of the authorities. Aided by trusty cohort Jessica Johnson (Penne Hackforth-Jones), the cunning bushrangers set out to capitalise on the great prosperity surrounding the gold rush. However, challenged to uphold the law, Lieutenant Keogh (Bruce Kerr) is on the case and never far behind the bandits.Featuring all 13 episodes and a Logie Award winner for best new series in 1976, Cash & Company includes a dynamic line-up of guest stars, including Terry Gill, Judith Durham (of The Seekers, performing six songs), Gerard Kennedy, Judy Morris, Michael Pate, Noel Ferrier and Tony Bonner. Driven by a lively theme from the 'Bushwhackers and Bullockies Bush Band' and directed by award-winning filmmakers George Miller (The Man from Snowy River) and Simon Wincer (Lonesome Dove), Cash & Company is an action-packed trip back to an era of horses, hold-ups and wild colonial boys. 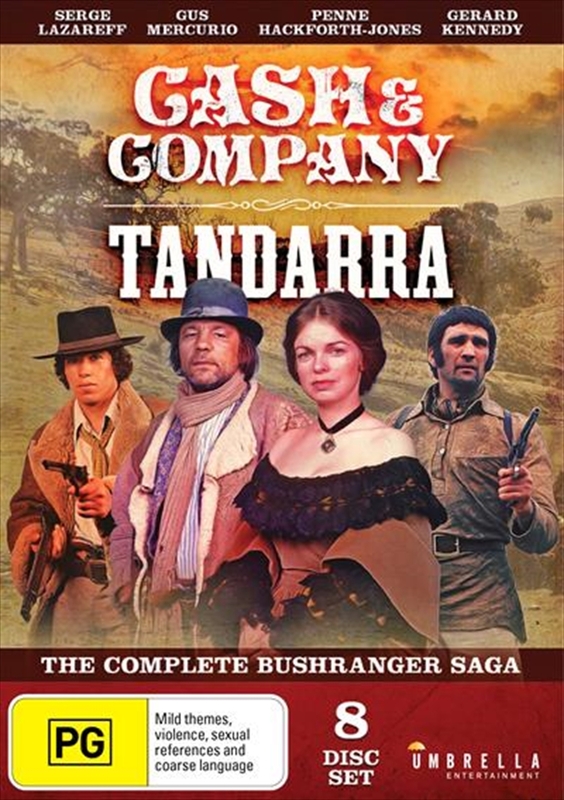 TANDARRA - Following the next exciting chapter in the lives of Aussie bushrangers, Tandarra is the lively spin-off of the classic 1850s era television series, Cash & Company.With Sam Cash out of the picture, Joe Brady (Gus Mercurio) is still wanted by the law for his past bushranging exploits. Remaining one sneaky step ahead of the authorities, in particular Lieutenant Keogh (Bruce Kerr), Joe continues to capitalise on the prosperity brought about by the gold rush - aided by his trusty cohort Jessica Johnson (Penne Hackforth-Jones) on her homestead named Tandarra. But this time around Joe has a new concern keeping him looking over his shoulder. He has a mysterious man on his trail named Ryler (Gerard Kennedy, Underbelly), a tough as leather bounty hunter, determined above all to get his man.Including all 13 episodes, Tandarra features an engaging line-up of guest stars, including George Mallaby, Norman Yemm, Terence Donovan, Max Gillies, Briony Behets, Maurie Fields, Val Lehman, Mike Preston, Peter Cummins and Anne Pendlebury. Filmed at the picturesque Emu Bottom homestead in Sunbury, directed by Russell Haig and Simon Wincer (Lonesome Dove), Tandarra continues the exploration of Australia's rich colonial past with a pounding sense of heart and adventurous spirit.